Times of San Diego editors and contributors collected five first-place awards and 16 in all Tuesday night at the San Diego Press Club’s 42nd annual Excellence in Journalism Awards. The 19-month-old independent news site founded and edited by local journalism veteran Chris Jennewein of Del Mar took second place to NBC 7 San Diego for Best Local News Website. Contributing photographer Chris Stone and her contributing editor husband, Ken, of La Mesa took home four first-place plaques for the Times. Jennewein won top honors for a portfolio of opinion columns. Nearly 400 people gathered at the Joe & Vi Jacobs Center in San Diego to celebrate the best work by local journalists and public relations professionals. “Journalists have by necessity become more entrepreneurial, and it has opened up publishing and broadcasting opportunities for a wider range of communicators,” said Kris Eitland, outgoing club president and event chair. The San Diego club’s awards program is among the largest regional competitions in the United States. More than 350 awards were presented in 136 categories, with a record number of entries, about 1,300. Six individuals won seven or more awards apiece, including Beth Accomando of KPBS Radio/TV (seven awards); Claire Yasbek Fadden, San Diego Family Magazine and About Town Magazine (seven awards); Rick Griffin, various (seven awards); Chris Stone, Times of San Diego (nine awards); Ken Stone, Times of San Diego and Voice of San Diego (nine awards); and Jamie Reno, (11 awards, including nine for work in the Reno Dispatch and two for Veteran Journal). Reno, recipient of the 2009 Drew Silvern Award, remains the Press Club’s most honored journalist in the history of the awards competition. Chuck Westerheide of NBC 7/39 won the Harold Keen Award for Outstanding Contributions in Journalism. Christina Simmons of the San Diego Zoo won the Andy Mace Award for Career Achievement in Public Relations. And Ena Marie Craig Newell of KPBS won the Jim Reiman Award for Excellence in Media Management. Ken Stone also took first in daily news feature for “How Boltman Became a Fan Favorite and the Chargers’ Nemesis” and second place for daily education story for “The Case of the Missing Alpine High School” — both posted on voiceofsandiego.org. Masterstrack.com, Stone’s blog on adult age-group track and field, took second in single-topic blogs. Judging in the professional categories was done by press clubs across the country, including Oklahoma, Alaska, New Orleans, Houston, San Francisco and Rochester, New York. 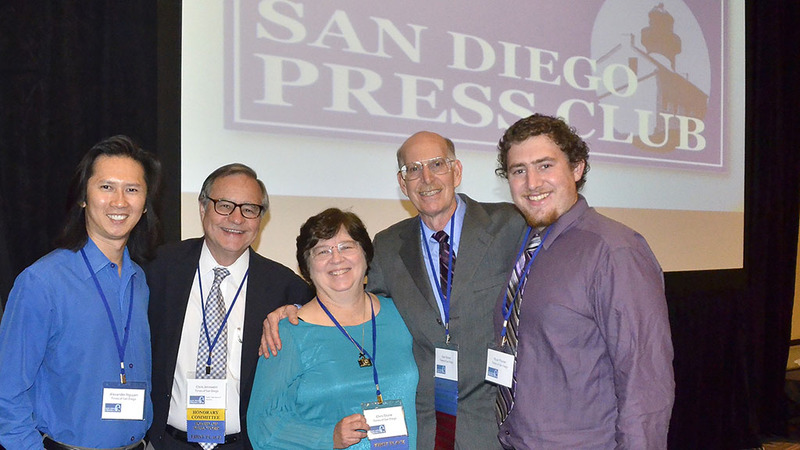 College media were judged by the San Diego Press Club Board of Directors.